The first match of the round ended in controversy as Hana protested KOSSA’s 3 – 1 win saying that KOSSA had fielded a player who was not eligible to play. The match itself was action packed and underlined KOSSA’s determination to get back into the title race after their 7 – 2 loss to Koloale a week earlier. 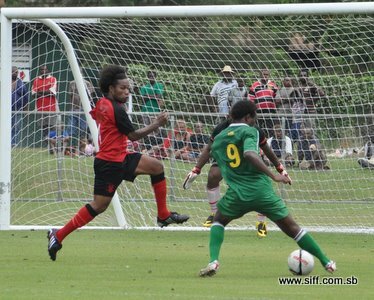 Micah Lea’alafa scored twice before Jack Samani wrapped up the win for them. Hana got their consolation goal from Joe Manu. Match result KOSSA 3 – Han 1. Marist Fire took on Malaita Kingz in the second match of the round on Thursday 3rd March. Malaita Kingz proved to be a resilient side and showed that they are improving in each match by holding their Honiara opponents to a nil-all draw. Elliot Ragomo top performed for Marist Fire but even he could not separate the teams as the defensive capabilities of Malaita Kingz came to the fore in a memorable performance for the provincial side. Fulltime score Marist Fire 0 – Malaita Kingz 0. The biggest match of the round was the encounter between league leaders Koloale and one of the contenders Solomon Warriors. Despite controlling play for a good number of periods in the game Solomon Warriors gave away the match to Koloale who claimed the victory narrowly by 1 goal to nil. Ian Paia continued his scoring ways by grabbing the winner for Koloale after Benjamin Totori set it up nicely for him. Solomon Warriors went close through James Naka a couple of times in the game but Koloale were able to keep their slender lead until the final whistle. Fulltime score Solomon Warriors 0 – Koloale 1. Western United made it 3 wins out of 4 when they defeated Real Kakamora 2 – 0 in the final match of the round. Real Kakamora were a much improved side and threatened Western United throughout the game. Western United had to work hard for their win and while their performance got the job done they missed a number of opportunities which could have seen them win by a better margin. Real Kakamora, on the other hand, are benefiting from the experience of coach Tommy Mana who is taking the team in the right direction and good results are certainly on the way for the Makira Ulawa side.